Tomorrow’s fabric protection available today! A new era in fabric protection has arrived – new BrellaGuard® utilises world first advances in bionic and nano technologies to deliver a highly resistant, environmentally safe and completely invisible fabric protection system. When applied to fabric surfaces, the active ingredients in BrellaGuard® function at a “nano” level by reshaping and crystallising with dendrimers (star shaped polymers) to form an impenetrable shield. Water and soil repellent, was permanent and abrasion resistant, patented BrellaGuard® sets a new benchmark in fabric protection. It’s the only product you’ll ever need to protect your sports and outdoor textiles. A unique shield that protects from the elements! 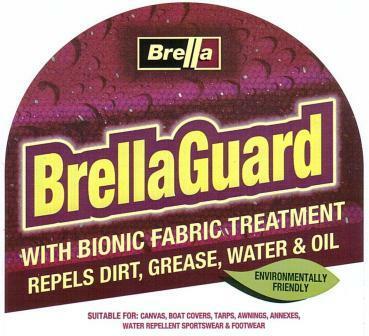 If your fabrics are exposed to oil, dirt, rain or snow, BrellaGuard® has what it takes to ensure a highly repellent finish for textiles that’s ideal for mechanical, technical, medical, decorative, outdoor or architectural situations. And because the system works a “nano” range, textiles finished with BrellaGuard® are soft to the touch in contrast to the often rough and stiff texture of conventionally finished materials. 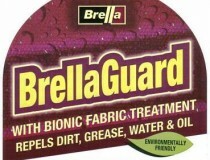 BrellaGuard® is one of the greenest products you’ll ever come across. Made from all natural ingredients, BrellaGuard® does not harm our precious environment in any way, shape or form.